In Plexiglass Box, Saskatoon artist Cindy Baker, moves about the streets of the city encased in a slightly bigger than phone booth size clear box. Within this protective enclosure the artist is simultaneously removed and immersed in the everyday world of passersby. For Baker Plexiglass Box is a shark cage from which to record nature’s dangerous creatures, a bank teller’s cage, a germ free zone ( la the boy in the bubble), a portable popemobile – all implying a need to protect the person inside. 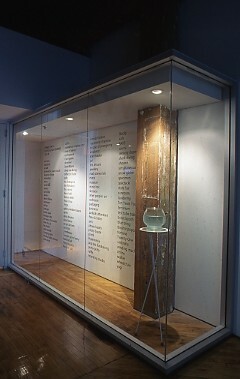 It references the annoying mime in his glass box, entertaining all who will pay attention, Houdini’s ‘inescapable’ glass waterboxes, Penn and Teller’s clear magic tricks with which they literally shatter the illusion of the magic establishment, women’s “glass ceiling” (and walls), a metaphor as relevant in the artworld as it is in business… Baker has presented Plexiglass Box in Saskatoon, Brandon, Winnipeg, Edmonton and Vancouver. To accompany her performance in Toronto, Baker will produce a project for the YYZWINDOW exhibition space. Exhibition supported by Drake Hotel. CINDY BAKER is an interdisciplinary artist, independent curator, writer, and currently serves as Programme Coordinator of AKA Gallery in Saskatoon. Baker received her BFA from the University of Alberta, and prior to her move to Saskatoon she worked for Latitude 53 Society of Artists, The Works International Festival of Visual Art and Sightlines International Print Symposium in Edmonton. Baker presented her work in performances and exhibitions at venues across Canada. Maura Doyle: Who the Pot?